The following essay originally appeared in issue 3.1 of The Scofield, which is dedicated to Kōbō Abe and the theme of home. You can download the issue for free here. 1) Pitfall. Based on Abe’s television play titled Purgatory, involving an impoverished miner who is murdered, and who then becomes a ghost that watches the humans he has left behind claim his body and life. 2) Woman in the Dunes. Based on the Abe novel of similar title, involving a man who is coerced into excavating a pit constantly filling with sand, from where he learns to love his fellow prisoner and the prospects of his life. 3) The Face of Another. 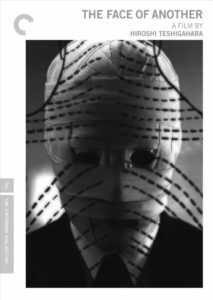 Based on the Abe novel of the same title, involving a chemist whose his face is mutilated in an industrial accident, and who must claim a new identity by taking on another man’s face. Three movies, three shifts of identity: alive to dead, free to imprisoned, disfigured to restored. We can add a fourth shift: from book to film; text to image. Originally conceived by Abe as pure language, these words emerge from a savage struggle into figures. A little like a full body transplant, the old brain straining to assert its self from within new skin and limbs. They are about the mind’s need to find meaning in any situation the body is thrown into. No matter the setting, we must construct the identity that allows us to inhabit it. If we fail to do this, we are lost. One last triad: Abe, Teshigahara, Takemitsu: word, image, sound. Three visionary, interdisciplinary talents; towering intellectuals of the postwar era. Three equally robust minds imposed upon one another: a uniquely potent situation. For three is not two, three never resolves into stability, into order. Three is a mischievous number. These men push one another into greater and greater discoveries. Alliances shift, the binary is forever being upset by that troublesome third. That dynamism is artistic strength. Much like the vast clouds of experience that coalesce into identity, there is no clear way of gathering the many points of intersection among the three movies made by Abe, Teshigahara, and Takemitsu. There are only the innumerable pinpoints through which a viewer may enter, the multitudinous observations that speak to that great circumscribing subject whose existence is no sooner intuited than it has shifted into a new form. The Oort Cloud is a hypothetical sphere of trillions of chunks of rock and ice that stretches perhaps as much as halfway to the nearest star. It is likely the largest structure in our solar system, though it is invisible to us, its individual pieces too small for our instruments to detect. It represents the absolute limit of our sun’s gravitational field, and therefore the very end of the system of heavenly bodies that houses us and our home planet. It is theorized that the sun’s gravity sits so weakly upon the Oort Cloud that the gravitational influence of passing stars, and even that of the Milky Way galaxy itself, can dislodge pieces of the Cloud, sending them crashing in toward the Earth, where they might be consumed by the sun, or detonate in our planet’s atmosphere, or simply fly by as a dramatic and unprecedented light in the night sky. Comets reaching us from the Oort Cloud can have orbits lasting thousands of years, and they have likely had significant influence on the evolution of life on this planet. When he died in 1993, The New York Times called Abe “the skeptical poet of an uprooted society.” Born in 1924, he came of age as his nation’s glorious empire was destroyed, its emperor humiliated, its age-old culture invaded by an alien way of life. Amid this convulsing social organism, how could Abe have turned his experience into anything but existentialist parables about dislocation and the trauma of identity? We are first thrown into this world uncertain, and over decades we build up a sense of narrative, granting our life a feeling of purpose. This is the basis of a stable, coherent, satisfying life. But then dawns the day when identity is profoundly contested. You are stripped of the job you have invested decades into. Your life partner is revealed to have lied to you for years. Your body is mutilated and no longer yours. Your community’s values transform into ideals you detest. These are the moments when you must doubt the story you have put your life toward. What then? How does one overcome this grievous loss? How to reclaim your life’s narrative? How to rebuild the certainty that only comes from decades of slow acquisition? There are frequently cases when we must construct our life narrative within a situation imposed upon us by duress. At these points one experiences a tension: always striving toward the meaning required by our nature, but also repulsed by the world that we are forced to find meaning from within. This is the crux of the existentialist worldview: the need to find meaning in a world that fundamentally alienates us. It is precisely this tension that gives these three movies their coiled energy. Anonymity is another word for estrangement. To be fully anonymous is to be fully alienated. Anonymity is to withdraw identity into perfect privacy, which is to deprive identity of oxygen. An identity’s survival depends on touch, it comes to resemble that which it is most touched by. When it is touched by nothing it comes to resemble nothing at all. At the most basic level, if one is not spoken to, it is possible to lose the faculty of language, which is the basis of all self-knowledge. If anonymity is the name for the person whose identity is perfectly masked, then what is the word for the person whose identity is perfectly known. Pitfall opens with the Miner dashing for his life through dark night. He is deserting his mine, which owns him like a servant. This is the only possible way to escape its grip. He strives to be free, and he succeeds, but freedom’s burdens are soon met: in order to eat he will connive, he will suffer backbreaking work and humiliation, he will walk into a trap that equals his death. In Pitfall, freedom = alienation; the Miner’s identity = his means of his escape. He must always be wary of freedom’s next pitfall. What is it to be free? Freedom means the possibility of a hidden or unsuspected danger. It implies hazard, requires risk, puts you into peril. At the least it forces you to experience difficulty, the possibility of being caught or snagged or stumbling. That’s one vision of freedom, call it individualistic. There is another; say, communal. It involves the art of submitting gracefully, of adapting to a role. 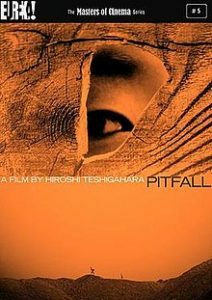 If the individualistic dominates Pitfall’s narrative, the communal claims the two films that follow it. There is always a tension between the individualistic and the communal visions of freedom; the freedom to discover one’s form vs. the freedom to inhabit a role. Abe’s protagonists must decide which freedom they can best tolerate. So must we. Junpei is an amateur entomologist hunting bugs in the desert. There is some easy irony to the insects he captures en route to being lured into an inescapable pit of sand. The genius of Woman in the Dunes is that it doesn’t merely set its existential drama in the desert; it makes the landscape a major character. The futility and forcedness of hauling sand, the impersonalness and implacability of the shifting pebbles. The tantalizing prospect of escape always seems so near at hand (how can something so paltry as sand grains spell Junpei’s doom?). And the estrangement of this chthonic place that enforces its enfeebling rules with a crushing power. I assume the place where Junpei is captured is the Tottori Sand Dunes, the only sizable desert in all of Japan, which Abe visited before writing his novel. In a perfect detail that no novelist would dare invent, this landscape has shrunk for decades and is in danger of death. Invasive crabgrass afflicts it, and concrete barriers meant to protect against tsunami now prevent the ocean from depositing dearly needed sand. Extensive desertification efforts are under way. The Japanese hope to save their only desert. Nonetheless, Tottori’s reputation of untamed wildness, of being a place where one might become unfindable, appears irredeemable. Perhaps it is a warning for those who, like Abe, would stand outside of society. The dominion that bodies cast over identity is unmistakable in the shots of a prosthetic finger that open The Face of Another. Dr. Hira declares, “sadly, this is not only a finger, it’s an inferiority complex in the shape of a finger.” Hira understands that our fragile bodies are indispensable and irreplaceable—break them and you break the mind that depends on them: “Inferiority complexes dig holes in the psyche, and I fill them in.” His patient is Okuyama’s destroyed face . We first glimpse Okuyama via an x-ray of his skull, and this gabbing jawbone is as close as we’ll ever come to seeing his true face, which is always swaddled with enormous bandages, or covered in Hira’s perfect mask. Okuyama would rather be a death’s head, or a covered head, or another’s head, than his own flesh. When medical science gives Okuyama a new face, it is an indication that modern medicine has given us all a new face. Our understanding of ourselves is predicated on its regime for interacting with our bodies and conceiving our minds. It construes what we see when we look toward those letters that spell human. When we look into the mirror, we see what medicine tells us to see. When next it makes a massive leap—perhaps it will be perfect genetic alterations, or the capacity to build motherless humans, or an entirely new concept of consciousness—our whole vision of ourselves will shift accordingly. Nuclear weapons: the ultimate authoritative father to terrify the modern psyche into obeisance. A subplot in The Face of Another treads deeply into their use upon Japan, a national disfigurement analogous to Okuyama’s deformities. Having seen its flesh mutilated, its empire and emperor taken, Japan felt the world’s eyes transfixed on its abasements. It needed a new face to survive. The stresses that came with this masking produced the social turmoil that gave rise to Abe’s collaborations with Teshigahara and Takemitsu, which chronicled the very stresses that enabled them. Were it not for the war’s traumas, Abe, Teshigahara, and Takemitsu would not have been possible. Absent the turmoil unleashed onto their society by a shocking modernization, what would have become of their genius? How could their creativity have taken the forms of alienation and existentialism to which it seems so uniquely suited? Perhaps certain veins of artistic genius cannot be worked in the wrong time and place. What if Virginia Woolf had come of age and written in the Victorian era and not between the World Wars—would she still have reached so deep into human consciousness to invent a form of prose capable of rendering it visible on the page? It is a fundamental function of art to ponder the conditions that made the world that requires the art. A mask can be in the shape of a bandage or in the shape of a face. The first will chasten the wearer, because it declares one’s anonymity; the second will empower because it hides anonymity beneath the best possible guise, authenticity. And this is also why the bandage can never come to feel natural, even though with time your old face might grow into the shape of the mask. Once the prosthetic has filled in the psyche, it ceases to be noticed as such—it is simply you. This completion is only possible with the most subtle, enduring of our prosthetics; for instance: language, image, ego, narrative. A dapper man dressed entirely in white murders Pitfall’s Miner, but the movie’s plot dynamics make it impossible to say why he kills. It is a wholly senseless killing, entirely unnecessary by the plot’s own logic. Who is the dapper man in white? For whom does he operate? And where does the Miner’s death fit into his plan? These answers remain unknowable because Pitfall does not give us the necessary information to piece them together. We must add our own information—say, for instance, that the dapper man was an operative of certain interests, or that he represents fate, or that he is an aspect of God. But we have no firm evidence for any of these conclusions, so the narrative ends in discord, like a jarring note of Takemitsu’s that leaves us wanting resolution. Suicide is the only form of death that is under our control; any other will necessarily impose upon our life narrative an endpoint that is outside our will. The occasion of your death will add a crucial detail to your life narrative, but it will have no meaning for you, only those you leave behind. Once you die you are no longer human, no longer of this Earth, and so you must care no more for your life’s story. But after he is murdered, the Miner is resurrected into an afterlife where he walks the Earth, and as he watches what the humans make of his death, he cares very much about the story they tell of him. This is the profound tragedy of the Miner’s predicament. He is forced to endure the fact that those who are still alive seek to make sense of his death, with no regard to his own interpretation. It seems that this would wholly undermine the peace that one supposes would make heaven idyllic: how could one inhabit the afterlife in equanimity while watching all the mischief survivors made of your life’s narrative? Which of us would not be like the Miner, endlessly bedeviled by the thought that they were getting it all wrong? All life long, we must wonder how and when we will die. For only a few moments will we know that death is imminent, and thus experience the resolution of this question. What insight comes in those moments between the realization that your time has come and the sweeping of death’s blade? What change does it bring to this thing we call identity? The fear of not knowing who one is; the fear that identity is not one’s choice; the fear of depending on one’s body; the fear of a world without fixed identity; the fear that there is no real identity; the fear of a life lacking meaning; the fear of a bad death; the fear of losing one’s identity in love; the fear of losing one’s identity in chaos; the fear of losing one’s identity in death; the fear that one will never determine one’s identity; the fear that one is superfluous; the fear that one is unnecessary; the fear that one is pointless; the fear that one wants what one is not; the fear of anonymity; the fear of the mirror; the fear of being unmasked; the fear of loneliness; the fear of being misconstrued; the fear of failing to express; the fear of expressing the wrong thing; the fear of never finding the right words; the fear that the unknown is all there is. There are many pits to be stuck in. There is the Earth’s gravity, from which only a handful have ever climbed free. There is the need to be nourished and to be loved. There is the entangling sense of self. There is language. There is culture. There is the body. Community. Relationships. Logic. Reason. Health. Etc. The horror of Woman in the Dunes is realizing that these pits are so integral to the human condition that it takes the most powerful possible art to make us realize that they are pits. What difference does it make whether all the sand that entraps you is slowly replaced by new sand if you are still stuck in the same pit? Or is it a new pit now—who cares? What difference does it make if all the cells of your body change but you’re still the same you? New body, old person. If all the neurons in your brain fill with thoughts and memories but they still comprise the same self? People are a flow of sand. The sand is the only movement. It’s constantly in motion, and it’s impossible to tell the new from the old. Through our individuality we generate life histories. These histories let others make judgments about us, and they let us construe the meaning of our lives. Any tampering with them is an existential threat both to ourselves and the communities we inhabit. Our understanding of humanity necessitates an enduring identity; if it could be changed at whim, we would could escape all rules, all morality. As much as the social order attempts to impose itself upon these identities, we must claim agency over our enduring self; otherwise we very rightly feel that our life is not ours but someone else’s. Part of the pleasure of these movies is in seeing what happens when identity is tampered with. Instinctively we know that this is perverse. Off limits. Identity should not be imposed from without; it should be the authentic result of a life lived freely. Our nature warns us from the methods required to actively construct a human psyche. Their results seem dubious. In Dr. Hira’s immaculately white office, Okuyama’s disfigured face is posed before two images: da Vinci’s Vitruvian Man, and Langer’s lines. The former is an idealization of the human body based in natural proportions, the latter is a map of human skin that is indispensible to cosmetic surgery. Combined with the miraculous medical technology present in The Face of Another, they are a means of perfecting the human form: Vitruvian man is the perfect human that we could engineer with Langer’s knowledge. Yet the new face that Okuyama dons is not perfect: it has a prominent mole on the right side, which Hira allows because it will make the disguise more believable. Hira rightly intuits that a perfect face would make Okuyama as much of an outcast as a disfigured one. Perfection will not heal the psyche; Okuyama needs a face that will accord him a place in the world. Which is to say, Okuyama’s problem is not one of aesthetics, it is one of alienation. His solution, no less than that wanted by the Miner and by Junpei, is not a perfected identity, it is one that belongs. When I wrote that last sentence, I realized that those words came from deep within me, for my own struggle was just that of Okuyama. He must feel that there is a place where he belongs, which is the foundation of his self. Like Okuyama, I too donned a second face to prove that I had at last found a place in the world; and also like him I watched this second face graft onto my first, until all that was left was this amalgam, which is in fact the truest face possible. What we do not want is a face of perfect aesthetic proportions; we want a face that we feel is ours, and that does not alienate us from our place in the world. By film’s end, Okuyama is on his way. And where is Junpei headed? By film’s end he seems to have found his proper place, and it appears to be one of servitude. Given the opportunity to escape his sand pit, he chooses to stay. His only remaining sliver of alienation from this world that has imprisoned him is the rationalization that he will just stay a little while longer so that he can complete an experiment he has been running with the water in the desert air. And here it is all too easy to feel implicated in this decision, so I do not besmirch Junpei making peace with what he now knows. But the ending of Pitfall, by far the most chilling of the three. Up until his death, the Miner had with him a boy, and once the older man’s end is met this young child wanders, detached from any other human being. At film’s end we see him setting out on a lonely road into a desolate landscape immense enough to swallow him without a thought. All he knows of the social organism is its brutality and danger, so perhaps he prefers the trials of abandonment to those of men. Ill-equipped to make sense of what even adults do not understand, he runs headlong toward the comfort of oblivion. From oblivion to acceptance to endeavor, these movies seem to be moving from abjection to hope. From 1962 to 1964 to 1966, this is perhaps a lens into the movement of the Japanese psyche as it built its miraculous postwar society. Three great Japanese artists were able to put everything they had experienced during a uniquely tumultuous period in their nation’s history into three films that explained something essential about what their country was becoming and how it was finding its new identity in a new world. In what trilogy of movies of today might one discern the movement of America’s traumatized psyche? Scott Esposito is the author of four books, most recently The Doubles from Civil Coping Mechanisms. They are a frequent contributor to the Times Literary Supplement and the San Francisco Chronicle, and their work has appeared in BOMB Magazine, Tin House, The White Review, The Lifted Brow, The Believer, The Washington Post, and others. They were a finalist for the 2014 Graywolf Nonfiction Prize. They are a senior editor for Two Lines Press and run The Quarterly Conversation.